This is an antique Windsor armchair, an English Victorian, country kitchen, stick back elbow chair in elm and ash dating to circa 1860. Stunning chair in fine order throughout Classic pierced back splat above and below the arm bow Raked, bentwood back bow with six spindles for comfort Armrests raised on oblique ring turned spindles Generous, elm, saddle seat slab displaying grain interest Raised on turned legs united by 'H' stretcher A super example of an antique Windsor armchair. Solid joints and construction, delivered waxed, polished and ready for the home. Dimensions: Max width: 56cm (22'') Max depth: 52cm (20.5'') Max height: 102cm (40.25'') Seat width: 36cm (14.25'') Seat depth: 37cm (14.5'') Seat height: 42.5cm (16.75'') We offer a 100% satisfaction guarantee with all of our antiques. Antique uncommon English Windsor stick back caned chair, England, late 19th century. 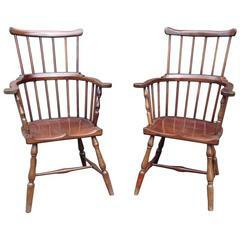 Uncommon model of this Classic Country chair, with caned woven back and original upholstery. A good English yew wood broad arm high back Windsor chair with a Christmas tree splat, the hickory seat supported on well-turned legs joined by single stretcher, circa 1840-1860.